The history of Výškovice goes back to the 13th century. In 1930, the village had 36 houses and a population of 183. Thirty years later, only twelve inhabitants remain. The 1970s see the houses demolished and the village erased from the map. Výškovice is first mentioned in 1273 when the village is referred to as Wiscouici. Výškovice fell under the administrative district of the nearby Premonstraterian monastery in the town of Teplá. In 1775, farmer Wuringer and his son-in-law Zaschka had the Chapel of Our Lady of Good Counsel built. The chapel was consecrated a year later by Count Trautmannsdorf, the abbot of Teplá. The original equipment had been preserved up until 1945. Not far from the chapel, a memorial plaque was put up in 1932 commemorating a visit by the poet J. W. Goethe to Výškovice on 21 August 1821. Locals had a basalt boulder brought here in Goethe’s memory and attached to it a bronze plaque reading “Zur Erinnerung an die Durchreise unseres Dichterfürsten Johann Wolfgang von Goethe am 21. august 1821″ and bearing the poet’s portrait. Apart from agriculture, locals earned their living by mining limestone and diorite. The mines were in close proximity to Výškovice. 28 houses, a population of 166, an ungraded school, 18 illiterate persons, 3 horses, 170 pieces of beef cattle, 4 goats, 294 sheep, 30 sows, 20 beehives. The village’s annual profit was 2,859 guilders and 73 kreutzers. Výškovice in 1930 _ 33 houses and a population of 161. Výškovice 1947_ a population of 30 and the local shooting of the film Border Village. 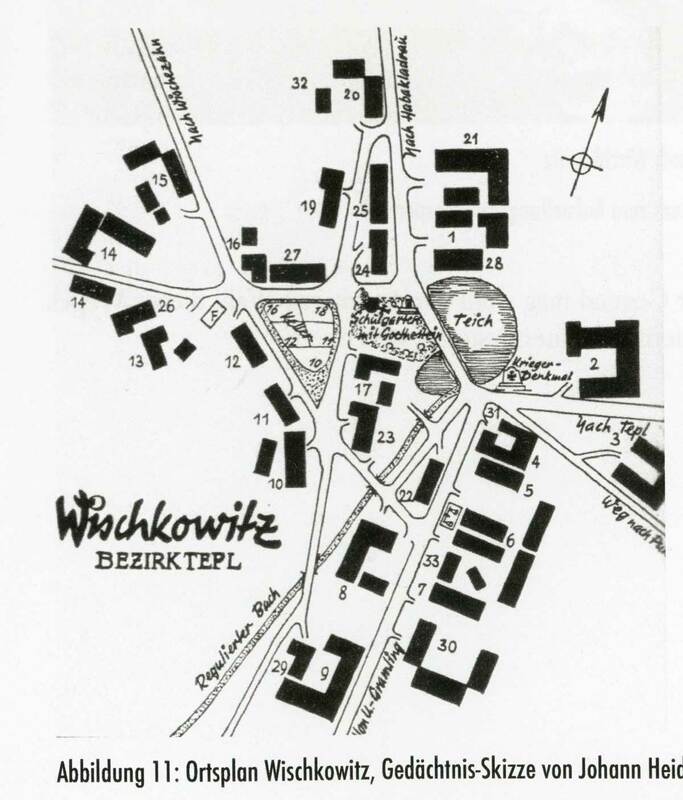 Výškovice 1965_ a population of 12; the village was put under the administration of the Local National Committee (the period equivalent of a municipal government) in the nearby village of Michalovy Hory. Výškovice 1970_ demolition of the houses launched; in 1974, the village is taken off the map.